We reluctantly took our leave of Ayr. We had spent a wonderful time there; but the Highlands called. We went through Glasgow and were gobsmacked by the size of it. I had an image of Glasgow being a quaint little village. It’s huge! We had intended a visit to Glasgow on our last visit 3 years ago. Unfortunately, Grams took ill and we never made it. Glasgow is a real metropolis and it has real traffic to prove it. Now that I look back, we wouldn’t have done well the last time since we didn’t have a vehicle then. You definitely need a vehicle to get around Glasgow. We drove past incredible scenery and wee villages just soaking in the beauty. Loch Lomand appeared suddenly on our right. We ooh’ed and aah’ed for miles. Stopping at the town of Luss about half the way up the west side of Loch Lomond; we left the van and took the wee path to Loch Lomond. 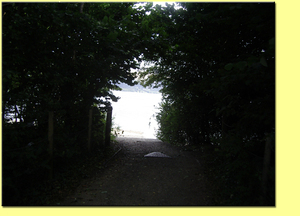 While we had been looking at the loch for some time, nothing prepared us for the view beyond the bushes. 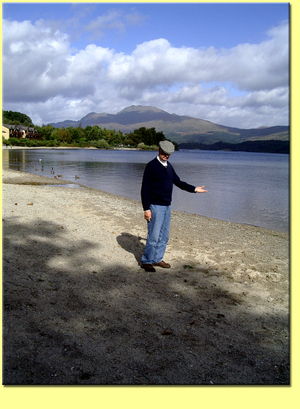 Right here I should talk about fortunate we were with the weather during our time in Scotland. As you can see the day was brilliant as were most of our days there. The weather turned fierce the day after we left for Wales. Now, Emlyn has a pond and keeps water fowl at his home in Wales. So, naturally, when he saw the swans he had to go talk to them. I kept my distance, since I know how territorial swans can be (I had a brief encounter with some swans in Chester once. ‘Nuff said). 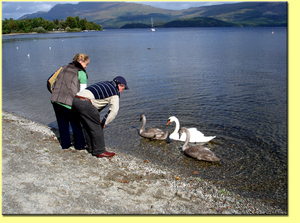 But, Emlyn and Marian enjoyed their visit with Her Majesty’s swans (they’re all HM’s swans in the UK). Big Guy couldn’t get over the scenery. Grams and Bronwyn had their hands full with Declan. The child acted as if he’d never seen a large body of water before. On the steep, steep side o’ Ben Lomond. Tho’ the waefu’ may cease from their greeting. LOVELY weather!!!! 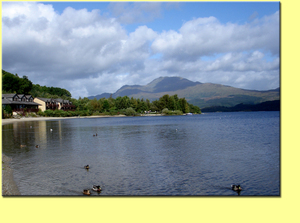 Nice to see blue sky over the lochs.